It’s long been a sabermetric truism that for hitters, strikeouts aren’t any worse than any other out — or at least, that strikeouts are much less harmful than is typically assumed. Strikeouts are slightly worse than outs on balls in play, since sometimes in play outs can advance or score a runner. But the difference between the two is minuscule, while fans tend to lampoon high strikeout hitters and overestimate the negative effects of strikeouts. So the sabermetric truism has stuck: strikeouts aren’t that bad. Hitters can have high strikeout rates and still contribute loads of offensive value through their plate discipline. After all, the end goal is not making an out, right? It shouldn’t matter how a player does it, simply as long as they reach base at a high rate and avoid making outs. But there’s a problem with this logic. While a player can be valuable even he strikes out frequently, strikeouts still decrease how often a player reaches base and can have an adverse effect on a player’s on-base percentage. They’re not as harmless as casual saberists typically assume. Let’s walk through a quick thought experiment. Say we have a player, Zadock Bartlett, who has good plate discipline (10% walk rate) but strikes out a high percentage of the time (say, 25%). Zadock is going to reach base 10% of the time due to his walks, but when he doesn’t walk, ideally he would like to reach base as often as possible through a hit. And there are two main ways Zadock could boost his batting average: have a high percentage of his balls in play fall for hits (in short, have a high BABIP), hit home runs, or put the ball in play as often as possible. That’s pretty straightforward, right? If a ball goes over the fence for a home run, nobody can catch it so it obviously goes for a hit. If Zadock has a high percentage of his balls in play fall in for hits — and some players can post BABIPs higher than league average on a consistent basis — then his batting average will obviously be higher. And if Zadock puts the ball in play more often, he’s giving himself more chance and opportunities for his balls to fall in for hits. To put it another way, when a player strikes out, they don’t give themselves a chance to get a hit. The more often Zadock strikes out, the lower his batting average and on-base percentage will be…unless he compensates through posting a higher BABIP or hitting lots of home runs. As you can see, hitters only start getting into trouble if they’re striking out in over 20% of their plate appearances — specifically, above 25% is the danger zone. Once you cross that threshold, even if you’re mashing a large number of home runs and walking at an above-average clip, it gets difficult to post a high on-base percentage. Once you start striking out in 25% (or more) of your plate appearances, it’s difficult to post an on-base percentage higher than .340; you either need to be a very powerful or very patient one, or be able to post a high BABIP. 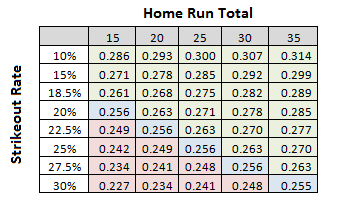 Of course, many of the hitters that strike out this often fall into one of these categories; most of them are powerful hitters that smash a large number of home runs and walk at a high clip as well. Problems arise when you’re a player like B.J. Upton: a player that hits for moderate power, but strikes out 25% of the time. With a slightly depressed BABIP (.275) and a strike out rate near 25%, his on-base percentage this season is a mere .310. And that’s despite having a 10% walk rate. I don’t mean to suggest that saberists should reverse course and start telling everyone that strikeouts are the devil; I’m simply trying to provide some perspective, and to remind everyone that strikeouts do have a negative consequence. If I see a rookie posting a strikeout rate above 25%, I’m going to start getting worried about them unless they’ve also shown good plate discipline and power. * When you’re striking out that much, your margin for success shrinks. *Well, or they’re an excellent fielder. Then they get some leeway as well. Batting average is a statistic that gets too much love from mainstream fans, but it tends to get undervalued among saberists. Getting a hit is just as important as drawing a walk — you can’t have a high on-base percentage unless you do both. And as often as we point to BABIP as the cause of a high or low batting average, a player’s strikeout rate can have an influence as well. We hoped you liked reading Why Strikeouts Stink by Steve Slowinski! This ShH Just Got Real! I’m excited for the next stage in FanGraphs evolution, in which people realize that simple common sense things are still correct. Even if there’s some mathematical data that shows they’re not quite as correct as they were once thought to be, they are not as incorrect as the reaction to that data made them seem at the time. Case in point: Strike-outs are bad for hitters. See also: Luck is component, but location of pitches has a lot to do with BABIP. In an argument over new vs. old ideas, both positions tend to become a little too extreme, but both of the examples you gave (BABIP and hitter strikeouts) strongly favor the sabermetric position. Strongly. Traditional Stats guy: Strikeouts are bad. They just are. Sabre stats guy: Strikeouts are bad because…. The first guy is correct, but he’s not going to convince anyone. People claim all sorts of things are common sense, but if it truly is common sense, they will be able to back up their position with numbers. The idea that putting a ball in play gives you a chance to get on base while a strikeout doesn’t is common sense supported by simple logic. You can back it up with numbers, but it’s not really necessary. I’m pretty sure an average fan can understand that without a ‘saberist’s’ help.